Donald M. McLeod, commander of the squadron of Track Aircraft aboard the Canadian aircraft carrier Bonaventure, made those statements when he flew into Northolt Airport, London, the night after the ditching of Flying Tiger 923. He had a film of the rescue operation and mentioned the young woman with a broken shoulder and injured back who had been taken on board of the carrier for emergency treatment. It was Mrs. Lois Elander who was looking for lipstick. It had been a matter of only a few short hours since she had been brought to the carrier. The gale force winds continued to whip the seas as the Canadian rescue helicopter broke through the storm just long enough to fetch her from the rescue ship and deliver her to the Bonaventure. Lois and her husband, Major Carl Richard Elander, West Point, NY, both 31, survived the ditching and the six hours of tossing and bobbing in the upside down, crowded life raft. While in the darkened airplane cabin, only moments before impact, they had said their final goodbye and waited in the ditching position for fate to unfold with the final impact. Contact with the raging sea came with a violent and deafening “bang” as the underside of the dying Flying Tiger ripped open and a wing was torn off. Lois Elander went blank on impact, but in the next fraction of a second she was aware of flying forward in her seat. Her back wrenched and her shoulder was broken. Her husband was clawing in the darkness to find her. She was able to release her safety belt, allowing the broken seat to fall away. Miraculously she got through an exit door and plunged into the sea. And somehow she then began to tread water, aware that unconsciousness was rapidly overcoming her and that she was in paralyzing agony. Her legs would no longer respond to the command of her brain to tread water. 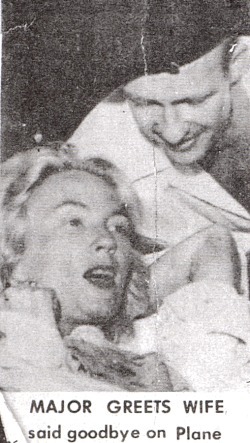 Within a short time, both Lois and Richard made it to the raft having survived the impact of the crash. They reached the Celerina and spent a night in one of the ship’s cabins. There was only one doctor on board the Celerina, Capt. Juan Figueroa-Longo. He himself was a survivor of the ordeal. He had 47 other survivors to tend to. Owing to the seriousness of her injuries, both Elanders were evacuated to the aircraft carrier Bonaventure the following day while the storm continued to rage. She would receive treatment in the Canadian ship’s hospital, having arrived on the carrier in tattered clothing gathered together by the crew of the Celerina. Very soon there were many more lipsticks in various colors showing up at the infirmary, a total of 27 tubes. Commander McLeod had not yet returned from his mission to find some lipstick. [Very recently this Web Site was contacted by Dr. J. Warren Axline, MD, of Fairfield, CT. Dr. Axline provided medical treatment to the Elanders after they were transferred from the Bonaventure to the large USAF hospital in Willshire, England known as RAF Burderop. He maintained contact and friendship with the Elanders ever since. To read the Elanders’ personal account of the crash and rescue, click this link to their story. This entry was posted in passengers and tagged Lois Elander. Bookmark the permalink. Another wonderful story of survival, compassion, indomitable human spirit, and lives lived. I love that five lipsticks turned up almost immediately. God bless those sailors!